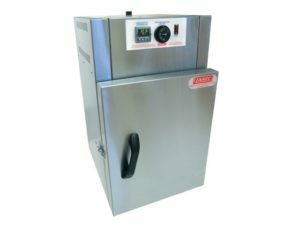 Labec Heat Only Incubator is manufactured in Australia with high quality stainless steel for easy maintenance and excellent durability. Suitable for applications where general incubation or warming is required. Using a jacket type heating system with elements bonded to the walls provides excellent temperature uniformity. Labec Heat Only Fan Forced Incubators are manufactured in Australia with high quality stainless steel for easy maintenance and excellent durability. Suitable for applications where general warming or incubating is required. Using a jacket type heating system with elements bonded to the walls provides excellent temperature uniformity. The fan forced convection heating circulates the warm air inside the chamber providing improved uniformity and recovery after door opened. Labec Performer Series Incubators are suitable for applications such as microbiological incubating which require precise temperature control. The tri-wall construction provides similar heating to a water jacket system together with an internal glass door provides excellent temperature uniformity, the spatial variation at 37°C is ± 0.5 °C. Labec Performer Series Fan Forced Incubators are suitable for applications such as microbiological incubating which require precise temperature control. The tri-wall construction provides similar heating to a water jacket system together with an internal glass door provides excellent temperature uniformity, the spatial variation at 37°C is ± 0.5 °C. Using fan forced convection heating which circulates the warm air inside the chamber provides improved uniformity & recovery after the door is opened.